EghtesadOnline: There’s a new sheriff in town and it’s stocks. So says Strategas Research Partners LLC, which argues that equities have supplanted bonds as the market to watch as drama builds around funding the U.S. government. Historically, it was the bond market whose convulsions worried policy makers when traders decided they were putting U.S. finances at risk -- so the legend went. But according to Strategas co-founder Jason Trennert, the signal from fixed income has gone dead after nearly a decade of financial stimulus. Stocks are all that’s left with enough volatility to react. They’re arguably more influential, too, with President Donald Trump taking credit for the bull market. On the verge of quitting the White House, Gary Cohn looked at the swooning equity market before deciding to stay, according to the New York Times. Tensions are building on the Capitol Hill as politicians wrestle with debt ceiling and tax reform negotiations. In the last several days, Trump has been criticizing GOP leaders in Congress, calling out Senate Majority Leader Mitch McConnell and House Speaker Paul Ryan by name on Twitter Thursday and blaming them for not addressing the debt ceiling sooner. While stocks continue to thrive this year in spite of a deeper retreat from the post-election rally in dollar and Treasury yields, lately they’ve felt more stress. According to Barclays Plc, the S&P 500’s decline of 0.9 percent on a risk-adjusted basis during the two weeks through Aug. 21 was the most among 10 assets. Over the stretch, stocks suffered two big bouts of selling as Trump warned North Korea against nuclear aggression and disbanded two advisory councils. 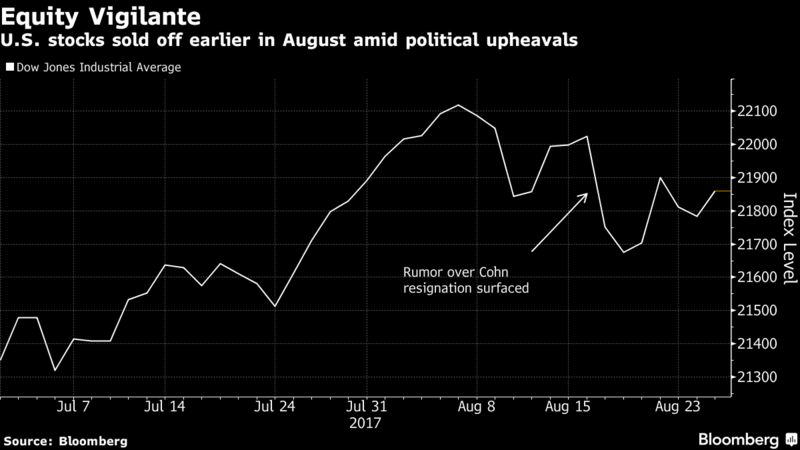 Speculation that Cohn would quit as economic adviser contributed to a 274-point plunge in the Dow Jones Industrial Average on Aug. 17. Cohn came close to resigning, but scrapped his plan after meeting with Trump, according to the Times, which cited one of the people briefed on the discussions. Cohn was “deeply troubled” by market reaction to speculation he was leaving, the report said, citing people close to him. “Bond vigilante” was coined by strategist Ed Yardeni in the 1980s to refer to investors protesting monetary or fiscal policies by dumping Treasuries. Central bank intervention has made it impossible for anyone to act as bond vigilante, leaving equities as the more plausible check on government, said Yardeni, who founded the name-sake research firm after working at Oak Associates Ltd. and Deutsche Bank AG.